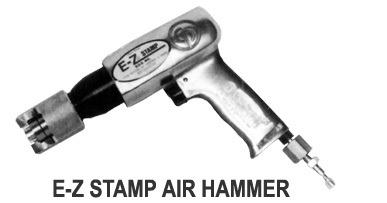 The E-Z STAMP only requires 60# of air pressure to impact information onto a cylinder. By rotating the E-Z STAMP clockwise slowly, the rapid beats (3200 BPM) drives the die into the cylinder or cylinder collar without denting or damaging. Within 30 seconds you have a new legible date that doesn't fade away when you clean the paint off the cylinder.